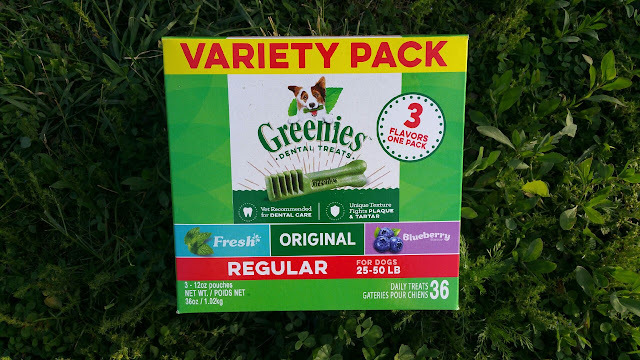 Being Frugal and Making It Work: Greenies Dental Dog Treats Variety Pack ~ Make Your Pups Smile! Greenies Dental Dog Treats Variety Pack ~ Make Your Pups Smile! I am fortunate enough to be a Chewy.com Influencer and in exchange for my honest reviews, my two spoiled pups get special food and treats, delivered right to our door, every month! Zena (English Mastiff) and Thor (Great Dane/Mastiff) are lucky dogs, I would even go as far as saying that they are very spoiled too! When they see the blue Chewy.com box being delivered, it's almost like they know it's for them! Give your pal the mouth-wowing treat that boosts dental health with the Greenies Variety Pack Regular Dental Dog Treats. Vet recommended for doggy dental care, these treats have a unique texture that fights plaque and tartar to keep teeth clean and maintain healthy gums, which means more smoochable moments with your fresh-breath pooch. This variety pack includes three tasty flavors your pup will love that are easy to digest and made with natural ingredients like real blueberries and spearmint. Plus, they’re accepted by the Veterinary Oral Health Council and proudly made in Kansas City since 1996. I also love the fact that Greenies come in a variety of sizes for dogs... regular, large, teenie, and petite! Whether your furry friend weighs 5 pounds or 150 pounds, there is a Greenies dog treat that is perfect for them!